Euro-Space Review 2019: Is Euro-Space a Good Hosting? 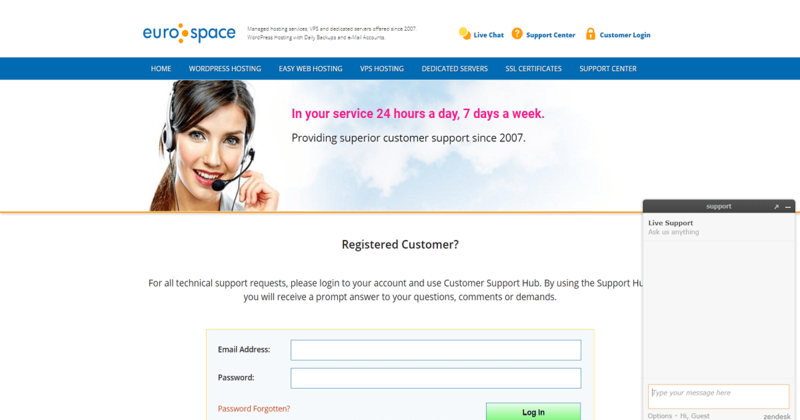 Euro-Space offers 24/7 technical customer support as well as 24/7 server monitoring for their VPS clients. They also provide powerful features and tools withall their plans, from redundancy to website analytics. Euro-Space is a Swedish web hosting provider established in 2007 and headquartered in Sweden itself. Their data centers are located mainly in the U.K., idealfor a European audience. They provide an ample number of features and pricing plans to cater to anyone from individual website owners to large businesses with resource-heavy requirements. Euro-Space makes it very easy to get your websiteup and running. All their hosting planscome with cPanel,one of the best web hosting control panels and the easiest to get comfortable using. You can easily manage all aspects of your hosting solution, such as running or stopping servers, checking statistics or managing your account. Euro-Space offers several pricing plans for users with different needs. All their plans come with a 15-day money back guarantee (but that’s a little below average). Easy WordPress Expert: 10GB storage, unlimited bandwidth, email accounts and websites, and free SSL certificate and dedicated IP request. All the above plans come with pre-installed WordPress. There are also several VPS plans for customers who require dedicated resources for maximum performance and uptime. There are four plans available, offering different amounts of storage, memory, and number of CPUs they provide.They all come with 100% uptime guarantees and 24/7 monitoring. I was thoroughly impressed with Euro-Space’s customer support. They truly are available 24/7 and I always got a prompt response, no matter how trivial my issues were. Their support doesn’t slip during the holiday season, weekends, etc. It’s also clear from how the staff treats you that keeping their customers happy is a high priority for them. onClick="trackClickout('event', 'clickout', 'Vendor Page - Visit User Reviews', 'Euro-Space', this, true);"
The offered VPs plan is ideal for my VPN gateway, allowing fast and secure communication. Server is always up (at least 3 month already, since I signed up). The price is around 8 euros, which is low if you compare with the great quality of the VPS and really helpful support. Would recommend this hosting to anyone. As their VPS and dedicated server packages form the core part of their products, Euro-Space is one of the few web hosting providers that are equally suitable for enterprise-level needs as well as for the individual website manager. Across the board, their prices are affordable compared to the competition, making them an attractive option for almost anyone. Wondering how Euro-Space stacks up against other Web Hosting companies? Enter any other Web Hosting company and we will give you a side-by-side comparison.